With our very first outdoor velodrome challenge on the horizon, using road bikes no less (don’t worry we’re still fixies through and through) we thought it may be the optimum time to undertake a professional bike fit, so we headed off to Giant Swansea (part of Tredz Bikes) for a PowerFit. 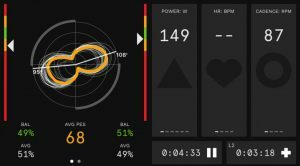 Developed by Giant and Wattbike in conjunction with leading sports scientists, PowerFit is based on biomechanic principles and delivers tangible, objective results proven through Wattbike pedalling force and efficiency analysis. It focuses specifically on improving your power output and balance through correct fit for increased performance and efficiency. Our director, Zoë Westerman met with Gareth Jones, based at the Giant store in Swansea and here’s what she learnt. A bike fit isn’t a ‘one size fits all’ experience, it will be different for each individual, which was evident as we started off with Gareth asking me a number of questions about my cycling history, aims and aspirations along with any injuries I’ve obtained over the time. Next up every aspect of my bike is measured up. Gareth then transfers these measurements to the Watt Bike for my test ride. The test ride records cadence, output and pedalling efficiency (PES). 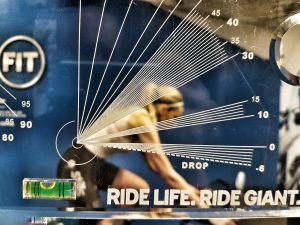 Pedalling technique is often overlooked, with topics like power readings taking the forefront in cafe conversation, but the truth is, mastering pedalling technique can bring about many benefits. 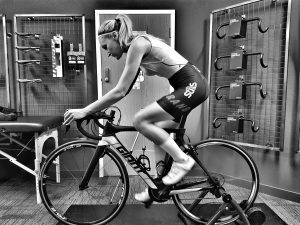 Whether you want to improve your FTP score by 10, 20 or 30 watts, improve your ability to climb (much needed in my case), or increase your speed whilst putting out the same effort, an optimum pedalling technique can help you get there. The PES test data is then explained to me. 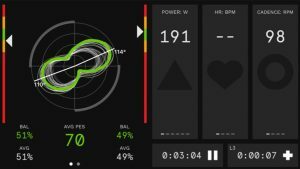 Wattbike’s technology measures and calculates your pedalling effectiveness to give you a score and displays a real-time pedal stroke graphic alongside a target score graphic, including a colour coded breakdown of green, amber, red. The ideal score reads 70-80 and stays in the green. When it deteriorates you reach amber, then red. This information is intended to provide the basis for adjusting your pedal technique until you’re cycling efficiently. Back to my bike then? Not yet….first up there’s an assessment of my posture and flexibility. Gareth examines my posture, flexibility and my range of motion. Thankfully I seem to pass all these tests although Gareth did recommend a series of exercises designed to improve my adductor strength, which again, just goes to show how bespoke and tailored the PowerFit session really is. There’s a quick alteration to my cleat position, then finally I’m on my bike but the testing continues. I’m poked and prodded and coloured dots are placed on my hip, knee and ankle, there’s a number of red lines and lazers as Gareth does some more measuring. I’m asked to cycle for about 5 minutes and all the while Gareth is walking around me, looking at different angles and body parts and making notes. He also takes some video and photos. With the results in, my bike is then altered, my saddle height brought up and forward, just a smidge. These new measurements are then transferred to the Watt Bike once again, and I undertake the tests again. And this is where that real-time visual really comes in. To end my session, Gareth gives me the option of the 3 minute Watt Bike Test, I reluctantly agree. I’ve got tired legs, I was at the track the day before. 3 minutes is a long time, that’s all I have to say about it! Every cyclist is unique, and every fit is different. The whole PowerFit experience is very personalised, it’s all about me (not a statement I use much, honest) and I’ve learnt a fair bit about my position on the bike and my technique. I’ve come away with my PowerFit report, detailing all my measurements, so that I can transfer these to any other bikes which I may have, use or hire overseas. And I’ve got all my Watt Bike PES score cards. I know that the age-old question is ringing in your ears; is it worth shelling out to find out what you might already know? In one word, Yes. 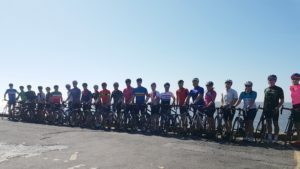 We’re all happy to spend this amount or more on a new pair of bib shorts or cycling shoes so why not for something that might just transform our cycling experience? PowerFit is an active fit that provides tangible data there and then. Our session took place at Giant Swansea, who can be contacted on 01792 762345 to book your own session or find out more about it. Of course, sessions can be booked at other Giant Stores, find your nearest here. Cyclone24 would like to say a big thank you to Gareth and the team at Giant Swansea for a very informative morning.